"but the word of the Lord remains forever"
52 Reflections on the Gospel of John: #20. 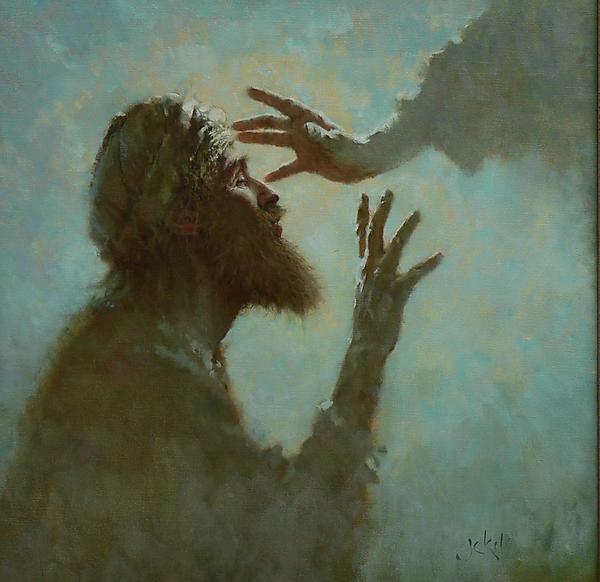 Healing the Blind Man (Part 5). Jesus has always been a divisive figure. People responded to Him with worship and praise or hatred and murder, and everything in-between. John writes, “a division occurred in the crowd because of Him” (John 7:43) and “A division occurred again among the Jews because of these words [of Jesus]” (John 10:19). This happened regularly. When Jesus comes around, expect things to get uncomfortable. That’s exactly what happens when He meets the man born blind. This man was a well-known beggar. He had parents and neighbors and a life. People had seen him every day. He only survived on the scraps that he could get from others. It’s amazing he reached adulthood. But Jesus changed everything. Jesus spat on the ground, made some mud, sent him to a pool, and he was healed. He came back seeing. When this happened, people talked: his parents, his neighbors, the whole community. This miracle did not go unnoticed. But not everybody was convinced. The neighbors couldn’t agree that this was actually the same man they all once knew. Some were saying, “‘Is not this the one who used to sit and beg?’ Others were saying, ‘This is he,’ still others were saying, ‘No, but he is like him.’ He kept saying, ‘I am the one’” (John 9:8-9). It was such an amazing transformation that this man experienced, that many argued about whether or not it was even the same person. Perhaps reading this should cause us to ask ourselves a few questions. When we go from blindness to sight after contacting the Light of the World, can people see this change in us? Does it amaze people who used to know you that you are really the same person you used to be? Jesus made this man almost unrecognizable. Jesus changed not only his eyesight, but his whole life and reputation. What change transpired in you when you came to Jesus? The man is then brought to the Pharisees. They need to make a judgment on the issue. Remember from the last post, the primary Sabbath issue is not healing the man, but that Jesus mixed liquid and dirt to make clay: “It was a Sabbath when Jesus made the clay and opened his eyes” (John 9:14). So when he tells them what happened, the Pharisees respond in different ways, “some of the Pharisees were saying, ‘This man is not from God, because He does not keep the Sabbath.’ But others were saying, ‘How can a man who is a sinner perform such signs?’ And there was a division among them” (John 9:16; cf. John 7:43; 10:19). Notice the two types of people. Some thought, “He sinned by making the clay, He cannot be from God.” Others through, “He healed a blind guy, He cannot be a sinner.” Some missed the forest for the trees. Some were focused more on the mud than the man. Some saw the Sabbath and not the sign. Just like the neighbors, the Pharisees wanted to verify that this actually was the same man who had been born blind. So they get his parents. As we read we find out that his parents knew three things: 1. He was their son. 2. He was healed by Jesus. 3. Confessing Jesus will have dire consequences. It will get them kicked out of the synagogue. So while they admit that he is their son who was born blind. They refuse to admit he was healed by Jesus. They try to remove themselves from the situation and put the attention back on their son by saying, “ask our son, he is old enough to answer for himself.” They seem to be fine with putting their own son in a difficult spot, but not themselves. “His parents said this because there were afraid of the Jews” (John 9:22). Fear kept them from confession. Jealousy, hatred, and fear are all determining factors when people react to Jesus. An incredible thing about this whole conflict though, is that Jesus wasn’t even around for it. He rubbed clay on the man’s eyes, and that’s the last we’ve seen of Him. Since then, the man washed, was healed, was doubted by his neighbors, accused by the Pharisees, and betrayed by His parents. He doesn’t even know what Jesus looks like. He doesn’t have all the answers to the controversy, but he says, “one thing I do know, that though I was blind, now I see” (John 9:25). He knows a sign took place and it changed His life. He comes to believe Jesus is a prophet (John 9:17). But the story doesn’t end there. The Pharisees claim discipleship to Moses rather than Jesus (John 9:28). If they really were disciples of Moses, by the way, they would know Moses wrote of Jesus (John 5:46). But the blind man is quite rational in his response: God wouldn’t hear Jesus if He were a sinner, but God heard Him and did something amazing through Him. Something that has never happened before. That’s what this blind man knew. The Pharisees respond in disgust. They expel him from the synagogue and arrogantly hurl the accusation: “You were born entirely in sins, and you are teaching us?” They couldn’t answer him. But they could silence him. Neither his neighbors nor his parents came to his aid. But Jesus did. Jesus found him (remember he still doesn’t know who Jesus is or what He looks like) and asked: “‘Do you believe in the Son of Man?’ He answered, ‘Who is He Lord, that I may believe in Him?’ Jesus said to him, ‘You have both seen Him, and He is the one who is talking with you.’ And he said, ‘Lord, I believe.’ And he worshipped Him” (John 9:35-39). This is the perfect example of what John has been trying to get His readers to do. To “come and see” who Jesus truly is. There are many opinions about Him. Some think He has a demon. Some think He is a blasphemer. Some think He is a sinner who breaks the Sabbath. Some think He is a prophet (John 4:19; 6:14; 9:17), the Lamb of God (John 1:29, 36), the Savior of the world (John 4:42), and the Lord and God (John 20:28). How do we know which view is correct? Watch the signs, hear the testimonies, be honest, and believe. This blind man may not have known much, but he knew, “though I was blind, now I see” (John 9:25).